Proteins can direct surface mineralization. We have published an article about the surface assembly of biosilica nanoparticles. The article was chosen for the inside cover. Lars Schmuser has successfully defended his PhD thesis. Congratulations Dr. Schmuser! Lars has accepted a postdoc position with Dave Castner at the University of Washington, Seattle. Johannes Franz has successfully defended his PhD thesis. Congratulations Dr. Franz! Tobias has accepted a position as Associate Professor of Chemistry at Aarhus University in Denmark. A joint poster of Helmut Lutz and collaborator Vance Jaeger wins the poster price at the MPI for Biophysical Chemistry. Our study of the interaction of ice nucleating bacteria with interfacial water has been accepted for publication in Science Advances. The article has attracted attention by media outlets as FAZ, E&EN News, Focus Online, The Verge, Life Science and others. The article can be found here. Science Magazine also has a movie on their website. Proteins are in constant motion and tracking protein motions at surfaces has been the white whale in biosurface science. 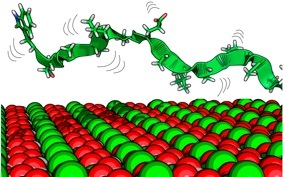 Towards this goal we have published a study of interfacial side chain motions in JACS. Snake scales are coated with a nanometer lipid film for lubrication. This discovery was made within a collaboration with the Gorb lab in Kiel and Joe Baio at Oregon State University and our group. A paper about this study was accepted for publication in the Journal of the Royal Society Interface (download). The article is highlighted in National Geographic (here). Helmut Lutz received a DAAD fellowship to visit the Pfaendtner group at the University of Washington for computer simulations of interfacial protein structure. Congrats Helmut! A presentation about lipid film on snake skin at the AVS conference in San Jose was advertised with posters at the conference venue as well as online media and the BBC. Tobias will serve a two year term 2016 - 2018 as the Treasurer/Secretary of the Biointerface Division of the American Vacuum Society (AVS). Johannes Franz was awarded the Best Poster Award of the Association for the Promotion of Polymer Science - Mainz. The poster entitled “Surface Spectroscopy of Protein-Membrane Interactions“ was co-authored by Lars Schmüser, Mischa Bonn and Tobias Weidner. Peptides and proteins can produce mineral phases, which would otherwise be unstable. Our study showing that surface-bound peptides can mineralize vaterite phase calcium carbonate directly at surfaces has been accepted for publication in ChemComm. Cell penetrating peptides with triggered activity are promising agents for controlled drug delivery. An investigation of the activity and safety of the pH-triggered peptide GALA has been accepted for publication in JACS. The article has been published online here. Xin-chun, member of Prof. Hsin-Yun’s lab at the National Chiao Tung University, has received a NCTU fellowship to visit us for six month. Xin-chun is working on DNA-metal interactions. Welcome Xin-chun! A paper about the fabrication of nanometer-thin silica sheets has been accepted for publication in Advanced Materials Interfaces. The work was a collaboration of our group and the Pfaendtner lab at the University of Washington. Members of the Parekh and Weidner groups have established a microscopy lab funded by the EU Marie Curie programm at the Paul Klee primary school in Mainz/Klein Winternheim. Together with local teacher Christiane Pfleiderer, the kids investigated insect adhesion, microbes and cells in hands-on lab projects. Thaddeus Golbeck, member of the Baio lab at the Oregon State University has received a fellowship by the IMPRS to visit us for two month. Thaddeus is working on protein-membrane interaction. Welcome Thaddeus! A study about a membrane fusion protein involved in building the photosynthesis platform in plants joint with partners at the Universities of Mainz and Amsterdam has been accepted for publication in Nature Communications. The full citation is Nature Communications 6, Article number: 7018. Our paper “Full membrane spanning self-assembled monolayers as model systems for UHV-based studies of cell-penetrating peptides” in Biointerphases has been highlighted as a ‘Most Read’ article and ‘Editors Pick’. A joint paper with collaborators at the University of Washington and the Oregon State University about the detection of cell penetrating peptides within lipid layers using depth profiling methods was accepted for publication in Biointerphases. 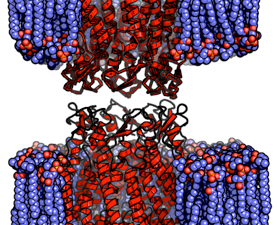 A paper about the structure of insulin at the air/water interface has been accepted for publication in PCCP. The work was a collaboration with Sergio Mauri and Heike Arnolds at the University of Liverpool. A paper joint with the groups of Jim Pfaendtner and Gary Drobny at the University of Washington about “Diatom mimics: directing the formation of biosilica nano-particles by controlled folding of lysine-leucine peptides” has been accepted for publication in JACS. The online version can be found here. A paper about “Sticky water surfaces: Helix–coil transitions suppressed in cell penetrating peptide at the air-water interface” for a special issue about biological water has been accepted in JCP. Helmut Lutz has received a fellowship by the International Max Planck Research School (IMPRS) to visit Jim Pfaendtners lab at the University of Washington for simulations of interfacial proteins. An article about mimics of viral fusion peptides “Reversible activation of pH-sensitive cell penetrating peptides attached to gold surfaces” has been accepted for publication in ChemComm. The work was a collaboration with researchers at the KIT and can be viewed here. Sergio has defended his thesis at the University of Liverpool and has joined us as a postdoc. Welcome Sergio! A joint paper with the NIST group of Daniel Fischer and ex-postdoc Joe Baio (Oregon State University) has been accepted for publication in ACS Combinatorial Science. The article entitled “High Throughput Analysis of Molecular Orientation on Surfaces by NEXAFS Imaging of Curved Sample Arrays” describes a new method for rapid screening of molecular orientation with NEXAFS spectroscopy. Hao Lu has joined our group as a postdoc to study biological films using X-ray photoelectron spectroscopy and non-linear optics. Welcome Hao! Elliott Fowler has accepted a two-month IMPRS fellowship to study insect adhesion in our group. Elliott is a PhD student at the University of Oregon working in Joe Baio’s lab. Gabriele Herrmann, MPIP expert for thin film preparation, joins our team to run the new XPS instrument. Welcome Gabriele! A collaborative paper entitled “Formation of Lysozyme Oligomers at Model Cell Membranes Monitored with Sum Frequency Generation Spectroscopy” with Izabela Rzeznicka from Tohoku University (Japan) was accepted for publication in Langmuir. The online version can be found here. Our new Kratos Axis Ultra spectrometer has arrived. Besides studies of biological surfaces, the instrument will be used to serve the MPIP as a versatile spectroscopic tool capable of XPS, UPS, ISS, imaging and several options for depth profiling including an Ar cluster sputter gun. A collaborative paper entitled “Effects of self-assembled monolayer structural order, surface homogeneity and surface energy on pentacene morphology and thin film transistor device performance” coauthored with material scientists Hong Ma and Alex Jen (University of Washington) has been selected as a Most Accessed Manuscript for 2013 by the Journal of Materials Chemistry C. The theme collection can be found here. Tobias Weidner has received the Early Career Investigator Award of the Biomaterial Interface Division of AVS. The award was announced during the 60th AVS International Symposium in Long Beach, USA and recognizes Weidner's work on protein–surface interactions. A presentation about ice nucleating proteins, coauthored with our collaborators from the MPI-C Janine Fröhlich and Ulrich Pöschl, at the 60th AVS symposium in Long Beach, CA was highlighted in science websites such as Phys.org, ScienceDaily, DailyMe, Cell Press Astrobiology Magazine, Science World Report and the Süddeutsche Zeitung. The Department of Chemical Engineering at the University of Washington, Seattle has named Tobias Weidner Affiliate Assistant Professor. Tobias has previously worked at the University of Washington as a postdoc and Research Assistant Professor and now has several active research projects with groups in Seattle. A collaborative paper with the Food Science group of Thomas Vilgis (MPIP) coauthored by Denise Schach, Tobias Weidner and Mischa Bonn about the role of protein stabilization of plant oil droplets has been accepted for publication in the Journal of Physical Chemistry B and is available online (Just Accepted Manuscript). Helmut Lutz has started his PhD project in our lab. A paper about surfactant adsorption at surfaces coauthored by Tobias Weidner has been accepted for publication in Langmuir and is available online (Just Accepted Manuscript). •September 2013 - PhD position available in our group - More infos here. Group leader Tobias Weidner and Prof. Jim Pfaendtner (University of Washington) have been awarded a joint research grant by the German Research Foundation (DFG) and the National Science Foundation (NSF). This grant will support a joint project about the molecular details of protein-driven biomass conversion. A paper about the structure and orientation of the electron transfer protein cytochrome c at charged surfaces co-authored by Joe Baio, Tobias Weidner, et al. has been accepted for publication in Biointerphases and is available online (open access). Michael Donavan has accepted a fellowship by the International Max Planck Research School (IMPRS) for studies of surface–protein interactions in our lab. A perspectives article coauthored by Tobias Weidner and David Castner (University of Washington) describing possible routes towards structure determination of interfacial proteins has been accepted for publication in PCCP and is available online. High school students from the Goethe Gymnasium Kassel visited the MPIP for a day of lab tours, hands-on experiments and discussion with scientists. A new method for combinatorial NEXAFS studies developed in collaboration with Cherno Jaye and Daniel Fischer at NIST allows the characterization of massive sample numbers in very short time. A paper describing the method has been accepted for publication in Analytical Chemistry and is available online. Vance Jaeger, a PhD student from the Pfaendtner lab at the University of Washington, has received a travel award from the International Max Planck Graduate School (IMPRS) to visit our group for three months. Vance is doing SFG experiments on enzyme-surface interactions. Graduate student Lars Schmüser was awarded a PhD fellowship from the Max Planck Graduate Center for his research on cell toxin - membrane interactions. • November 2012 - PhD position available in our group - More infos here. Group leader Tobias Weidner and Prof. Gary Drobny at the University of Washington have been awarded a joint research grant by the German Research Foundation (DFG) and the National Science Foundation (NSF). This grant will support joint efforts to elucidate molecular mechanisms of biosilica formation. Tobias Weidner has been awarded a Career Integration Grant by the European Union to support research aimed at understanding molecular mechanisms driving biomineralization. Amyloid fibril inhibitors can be less efficient at membrane surfaces. This is the result of a JACS paper coauthored by Michael Schleeger. The full citation is: J. Am Chem. Soc., 2012, 134 (36), pp 14781-14788. A communication describing a high resolution study of peptide-mineral interactions using NEXAFS and SFG has been published in JACS. The full citation is: J. Am. Chem. Soc., 2012, 134 (21), pp. 8750–8753. The National Science Foundation awards Joe Baio a postdoctoral fellowship for biomimetic studies at the MPIP. Specific proteins can act as Nature’s engineers of both hard and soft tissue. Proteins can ‘sculpture’ biogenic minerals and shape cell membranes. The control interfacial proteins exert over biological surfaces has relevance for disciplines as diverse as cell biology, bio-sensor research, biomimetics and material science. We use methods based on static and time-resolved sum frequency generation to probe the orientation, structure and dynamics of proteins at interfaces. Near-edge X-ray absorption fine structure (NEXAFS) spectroscopy and microscopy are used as complementary tools to probe protein binding chemistry, surface distribution and side chain structure. 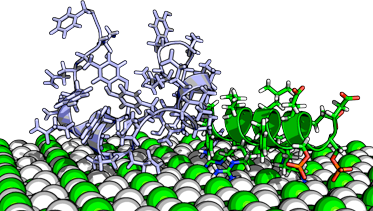 The goal of our research is to understand the mode of action by which surface active proteins interact with and manipulate interfaces.